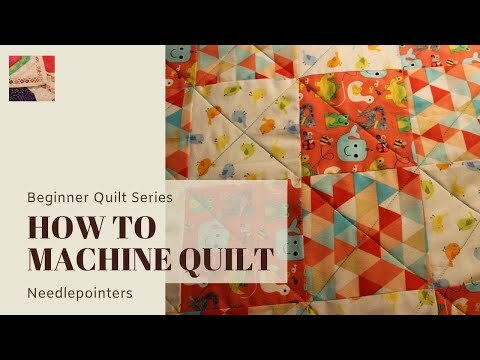 This is another video in our learn to quilt series. 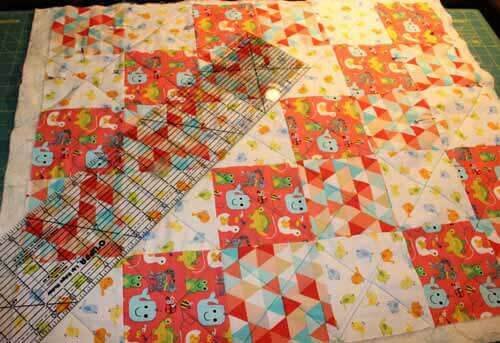 We are making a basic baby quilt with 5" squares for this series. 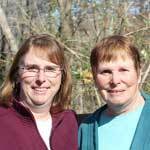 To find all of the other videos in this series, scroll down the page to find the links. This video will show how to quilt a quilt. Quilting the top attaches all the quilt layers together - the top, the batting and the backing. Watch the video or scroll down for written instructions. Click to watch the Learn to Quilt - Quilting the Top video in Youtube. A simple method of quilting is straight line quilting. 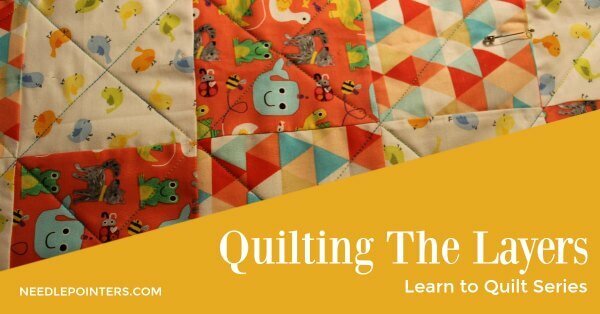 This is a great technique for beginner quilters. In this technique, you sew straight lines across the quilt. You can sew them between each block, at specified intervals across the quilt, or even diagonally. For this quilt, I decided to quilt diagonal lines across the blocks in each direction. These lines of stitching form an "X" across the blocks as you can see in the photo above. To mark, always start near the center of the quilt. We want to work our way from the center to each edge. Start from near the center and then do all of the lines from the center to one side. Then, start again from the center and work out to the other side. Once we get the lines finished in the first direction, we will then turn our quilt and follow the same procedure to make the second set of lines which will then make the 'X' in the center of each block. To make sure straight lines are sewn across the quilt, it's recommended to mark a line that you can follow while sewing. To mark the lines for this method, place your ruler across the blocks lining up with the corners. Use a marking pencil to mark the line on the quilt. Before marking, remove any pins that are in the way. I use quilters or dressmakers chalk marking pencils. There are many types of marking pencils and you can use your favorite. Just be sure that the marking pencil you use will wash out. You may need to move your ruler across the quilt. Just move your ruler and line up the ruler with the next set of corners and mark. After you mark each line, sew that line. Setup your sewing machine with your quilting thread in the top and bobbin. I used a variegated cotton thread for my quilt. Set your machine for a straight stitch and make the stitch length a little longer than normal length. I used an open toe foot when I quilted my quilt for this demo. A walking foot can also be used when quilting a quilt top. The walking foot can get a better grip on the top and bottom of the quilt top layers to make sure it feeds evenly through the machine. To sew the lines, start off the edge of the quilt in your batting and then sew onto the quilt. There is no need to backstitch because the edges will be cut off and later the binding will be added. The binding will hold the stitches in place. Once you finish the first line, continue to the next line and work your way across the quilt. Do one line at a time and remove only the pins for the line you are working on. Otherwise, your layers can come undone and they will not sew together properly. After you work your way from the center to one corner, then go back to the center and work your way from the center to the other side. 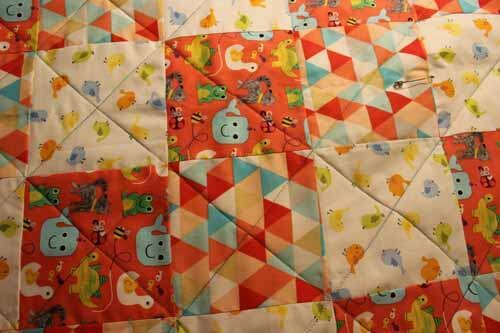 To make the 'X' on each block, stitch lines in the opposite direction across the blocks. Using the same method as before, start from the middle and mark your lines and sew.